Why Is Acceptance So Hard? I’ve been struggling with acceptance lately. I’ve never been one of those people who can just say “Whatever!” to a situation or person and walk away. I want to understand the situation, or understand why someone is feeling or acting a certain way. I suppose I’ve always been sensitive to others reactions to me. And, of course, I always tend to think it’s my fault if they’re angry or upset. The idea of acceptance was and continues to be a huge part of my recovery. Mainly, because the reaction I had to situations and my perceived notions about others often caused me to drink. In early recovery, I learned (and accepted) that my behavior had been totally self-centered. Well, surprise! Your character defects (as we refer to them in recovery) don’t just go away once you get sober – you actually have to deal with them! The truth is, I can be very self-centered at times. I obsess about how others react to me (or don’t react) and am positive I must be the main source of their discontentment or anger. And, as much as I want someone to change, to be a different person and act a different way, I have a very hard time accepting them as they are. I’ve gotten better – way better since getting sober. But, I still struggle. I still want some people close to me to be a certain way – a way I know in my heart they will never be. I want them to say certain things, do certain things, ask certain things – things that will make ME feel better. Again, it usually comes back to me and how THEY are making ME feel. For me, acceptance means accepting people and situations as they are right now – as God intends them to be. The only person I have power over is myself, and even that is very limited. As much as I would like to at times, I do not control the universe (which would be very scary!). Each day, I pray that I can be the best person God wants me to be. Nothing more, nothing less – just me. Acceptance is hard – it’s really hard. But, through acceptance I have experienced a sense of peace and contentment that I have never known before. When I truly give it up to God, and say “Okay, this is not about me,” it gives me room to be the kind, loving and encouraging person I want to be. And, most of all I accept this journey I’m on – this imperfect journey of acceptance. Denise, I so agree with you! I’ve been trying to do the same – focusing on my own little family unit. It’s easier said than done, but I find myself so much happier and content when I let go of what others are thinking/doing and enjoy what’s right in front of me! Oh Chenoa! It’s like you got into my own mind/heart! I am 100% the same way about how I process my interactions with other people. Why don’t they want to be my friend? Why would they purposely ignore me? Why would they not ever ask anything about my life? Why me?? LOL! We are complete kindred spirits girl. 🙂 Thank you so much for sharing this! Vanessa, thank you! Yes, we are kindred spirits indeed! I think it all comes down to MY need to make sure others are happy. In the past, this was a slippery slope because I would often forget about my own happiness in the process. It’s in my nature to want to take care of others, to fix things. I constantly have to remind myself that I’m not in charge – He is! So, I pray and talk to Him and try to let go the best I can. That’s all we can do, is always try to be a better version of ourselves – always learning and evolving. Hugs to you! I have so much to say, I am afraid WordPress is going to cut me off… is there a word limit in the Comment section? I had some unplanned downtime and decided to tool around a bit in the recovery blog section, found yours and realized I recognized the name as someone who has “liked” some of my posts. And then I read, and read, and read. It was as if someone had written my biography! The things we have in common are too numerous to mention, but I will say that I can relate to every single thing you write. You have such a gift for expressing the complicated emotions of early(ish) sobriety, and I am beyond thrilled that I found you! As for the topic of your most recent post, I want to share a (much abbreviated) story. This morning I backed out of my garage and forgot my father-in-law had parked his trailer in our driveway, and so I hit it with the back of my mini-van. Being the exact same type of person as you describe above, you can imagine the pit in my stomach as I realized that I would have to tell A. my husband, and B. my father-in-law. As a stay-at-home Mom, my mind instantly races to the cost that will be involved, and how I am draining our family of its resources, while contributing nothing. Now, in reality, this was nothing more than a fender bender, and, by the way, it is my fender that is damaged… the trailer is fine. But still, the thoughts that race through my head, I am guessing I don’t have to describe them to you. And so I shot a quick prayer up, then did the next right thing… I picked up the phone, and made the necessary phone calls. My husband, was, I’ll be polite, less than pleased, which took the knife already in my stomach and turned it a few times. But in sobriety we learn to clean up our side of the street, right? It was an accident, I am human, and thank the Good Lord I had the accident while sober. So I did what I needed to do, but now I’m working on the acceptance part of other people’s behavior. It would be very easy to build a resentment over my husband’s reaction to my honest mistake, and then turn that resentment into self-pity, but I know that will lead to nothing good. I also know in my head that I can only control my behavior, and no one else’s. Of course, knowing something intellectually and feeling it in your heart are sometimes two different things entirely, but it’s about progress, not perfection! So I guess there is no word limit. Sorry for the lengthy comment, but what you wrote really struck a chord with me today, and I am just so grateful to have found you, just when I needed you! Thanks for writing. Thanks so much for taking the time to write! I loved reading your story about the fender bender – I couldn’t help but smile. Oh yes, I know exactly the feelings/thoughts you describe. Sounds like you handled it well and used the “tools” to get you through. Thank God for the Steps and those “tools!” And, believe me, I always have to remind myself about the “progress, not perfection” component of sobriety – and life in general! Thanks again for your comment. I’m glad we found each other! Thank you for your insightful post, Chenoa. 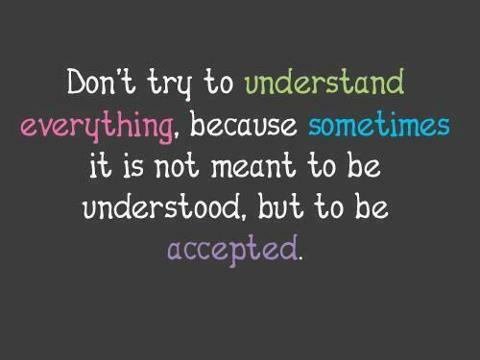 It’s so true that acceptance–true acceptance–is really hard. I have been thinking and writing a lot about acceptance lately on my own blog and one of things that makes it so difficult is that true acceptance of others (and things), in my view, requires us to defuse or at least diminish the negative feelings, such as fear, anger, and resentment that are provoked by the person or thing that we try to accept–and that isn’t easy! It’s one thing to say we accept that person, but to do so w/o resentment, etc., is quite another. Thanks for your comment, Danny. You’re so right, it’s the fear and resentment that often get in the way of my acceptance of other people or situations. However, letting go of that fear and resentment makes room for true peace and contentment, which is exactly how I want to live my life! I look forward to exploring your blog more. You have a very inspiring story! Thanks again. You nail a lot of the things right there, Chenoa. It is sometimes easy to intellectualize these kind of things, but harder to feel it in our selves and hearts. I understand that someone’s shortness with me isn’t about me, but it doesn’t mean that I don’t always feel it. But accepting and letting go comes easier with practice and gets better over time. For example, my boss might be gruff and rough one day and in the past I would have been trying to figure out what it was that I did that pissed him off, or had him “mad at me”. It would have eaten my lunch all day. Today, I brush it off – he’s in a mood for whatever reason. If it was me, he would be talking to me about my performance, etc. If my wife is grumpy, I will let her be, or ask if she wants to talk. If not, then I go to my man cave and play Angry Birds or something. It’s not mine to take on. Nothing is by accident, and the way I look at things is that if God loves that person, then I need to love them the way that He does. Not easy, lol. But like you said, I can’t control others, so I need to see them for what they are. the only thing I can control is me and my reactions. Wonderful insight in your post. Thanks, Paul. You’re so right. My sponsor always reminds me that we are all God’s children. I love that and I have to constantly remind myself of this when I’m feeling resentment towards someone, or obsessing about their reaction (or lack of) to me. Oh, and also reminding myself that it’s not about ME! My alcoholic self always tries to make ME the center of the world. Progress, not perfection – right?! Thanks for pinpointing acceptance and the deception in trying to attain. I have battled with my own issue of self identity/acceptance for 60+ years. A complete break down 15 years ago brought about great challenges. And so, I was more isolated than ever. Through a long period of recovery was the idea of accepting who I was. And that has opened my eye to be accepting of others, without demands. Thanks for your comment, Rich. Acceptance is so hard, but so necessary if we want to live at peace with ourselves and others. Thanks for reading. Lol! I’m glad we found each other! I love the blogging community. It’s one place I feel I can truly be myself. However, sometimes I find myself getting caught up in that “but what are they going to think?” mentality, but then I usually say “what the hell” and write whatever is on my mind!